Laypeople are increasingly motivated to participate in design processes, but what knowledge do they actually possess that enables such participation? Some studies show that laypeople have gained detailed product knowledge from exposure. This knowledge can be applied to accurately recognize product categories, and to manage emotional expectations. In the experiment presented here, we test if laypeople can apply product category knowledge to production tasks using an animation production toolkit designed by the authors. In a between-subjects experiment, participants with and without production training produced 3D animations for four distinct genres—comedy, drama, action, and non-fiction. Their task was to deliver versions of a basic animation film by adapting the motion of the film’s central figure by using an interactive test device. This device allowed participants to control four parameters of figure motion: velocity, efficiency, fluency, and deformation. As predicted, the animations produced by laypeople and experts were highly similar. We argue that in comparable cases it is important to not underestimate laypeople’s product knowledge, as toolkits could be designed to align to this implicit production knowledge in order to increase the motivation of laypeople to participate in the design. Keywords – Knowledge, Expertise, Genre, Motivation, Toolkit. Relevance to Design Practice – This paper shows that laypeople possess product exposure-based knowledge that they can successfully apply to participation in the design process. We therefore suggest involving laypeople in deeper levels of production by making more challenging toolkits, since this is expected to result in increased enjoyment of task and product. Citation: Visch, V. T., Tan, E. S., & Saakes, D. P. (2015). Viewer knowledge: Application of exposure-based layperson knowledge in genre-specific animation production. International Journal of Design, 9(1), 83-89. Received January 8, 2014; Accepted November 10, 2014; Published April 30, 2015. Copyright: © 2015 Visch, Tan, & Saakes. Copyright for this article is retained by the authors, with first publication rights granted to the International Journal of Design. All journal content, except where otherwise noted, is licensed under a Creative Commons Attribution-NonCommercial-NoDerivs 2.5 License. By virtue of their appearance in this open-access journal, articles are free to use, with proper attribution, in educational and other non-commercial settings. Valentijn Visch works as an associate professor at section Design Aesthetics of the faculty of Industrial Design at the Technical University Delft. He conducts and coordinates persuasive game design research, often in collaboration with creative industry and healthcare institutes. Valentijn has a background in Literature (MA), Art Theory (MA – postgraduate Jan van Eijck academy), Animation (postgraduate NIAF Tilburg), Cultural Sciences and Film Studies (PhD - VU), and experimental emotion research. Ed Tan is a professor of Media Entertainment at the University of Amsterdam’s school for communication research (ASCoR) since 2003. Trained as an emotion psychologist, he has studied the experiences that spectators of visual arts, theatre, and film and users of digital media typically have. His research addresses the question of how these experiences are dependent on media characteristics such as theme and style, and on largely implicit media competences of the user. Recently he has focused on describing and accounting for experiences of engagement in film, narrative and gaming and the use of such accounts in experience design. Daniel Saakes likes making things and making things that make things; he is interested in design tools for non-professional designers. He holds a Bachelor, Master, and PhD from Delft University of Technology in the field of Industrial Design Engineering. He works as assistant professor at KAIST since 2013 and coordinates the “my design” laboratory in the department of Industrial Design. Product designers are able to design their products so that users recognize the intended functions and expressions of those products. It can be assumed that users acquire knowledge about specific features of any product type by repeated exposure to it, and that this knowledge facilitates recognition of and usage of new instances of the product type. For instance, when people buy their first mountain bike, it may be difficult to recognize certain product functions, such as the use of a suspension lock-out, or to differentiate between product expressions (i.e., every bike looks aggressive). Looking at bikes in magazines or using the bike of a friend increases knowledge of mountain bikes: Functions become clearer (a lock-out button is good for riding up steep hills) and identification of product expression becomes more refined (some mountain bikes express impressiveness, others aggressiveness or comfort). This paper will focus on exposure-based product knowledge of a user. Specifically, we test whether the use of this knowledge is restricted to product recognition only, or if it can be applied for product generation purposes as well. In order to eliminate the effect of product use in the acquisition of product knowledge and to focus solely on knowledge gained through product exposure, we confine the research to the product of animation films. We compared the production performance of two groups of participants in a task requiring knowledge of film genres. One group was comprised of laypeople who can have acquired this knowledge solely by exposure to film; the other was comprised of animation experts who have acquired genre knowledge as part of their production experience. Their production task consisted of generating genre-typical animation films. This paper reports support found for the use of exposure-based layperson knowledge in a production task and discusses the implications for toolkit design. Product exposure seems to automatically induce learning in viewers/users. For instance, product placement in fiction movies has been shown to enhance implicit choice behavior for the brand, memory for the brand, and even attitudes toward the brand (Yang & Roskos-Ewoldsen, 2007). With respect to learning effects, d’Ydewalle and Gielen (1992) showed that exposure to subtitles in television programmes automatically induced reading by the viewer, resulting in enhanced lexical vocabulary (Van Lommel, Laenen, & d’Ydewalle, 2006). Some knowledge acquisition processes can go unnoticed by the user, in contrast to, for example, learning foreign language vocabulary in class or editing in a film course. Exposure-based knowledge acquisition could therefore best be defined as implicit learning, since it “results in knowledge which is not labeled as knowledge by the act of learning itself” (Dienes & Perner, 1999). Implicitly learned materials and skills are not inaccessible, as the term may imply. Knowledge is by definition accessible in some way, be it procedural (knowing how i.e., habits, skills, and conditioned reactions) or factual-declarative (knowing that). The cognitive mechanisms underlying implicit learning have been accounted for in the simulation model of Barsalou (1999, 2009). According to this model, previous experiences are stored as simulators that capture not only their cognitive elements but also affective and sensorimotor elements. Incoming perceptions activate a mental simulation of past experiences and the two are matched. Since the match is never perfect, each incoming perception involves adjustment or acquisition of simulators, resulting in learning. Importantly simulators are not restricted to specific modalities but comprise full multimodal experiences, including bodily sensations, visual cues and emotions, and also conceptual categories. Film genres as categories are thus mentally represented through simulators, along with their typical sensory, perceptual and emotional features. It is likely that regular exposure to a variety of film and television genres will implicitly enhance the viewer’s knowledge on the specific film features common to the genres. For instance, television viewers, after having seen one or a few instances, can categorize a television show as comedy upon hearing a laugh track. Laugh tracks are a prominent feature of comic genre recognition, but recognition experiments show that people are able to accurately recognize genres by less prominent features. For instance, writing style is used to distinguish fiction from non-fiction writing (Hayward, 1994), rhythm to differentiate music genres (Dalla Bella & Peretz, 2005) and character movements to tell film genres apart (Visch & Tan, 2008). Similarly, Honing and Ladinig (2009) showed that passive music listeners acquire detailed knowledge on musical timing through exposure only, which they can apply to accurately discriminate between manipulated versus original music recordings. Importantly, they showed that there is no difference in discrimination capability between passive music listeners and active music performance experts. This indicates that persons lacking musical performance training can implicitly acquire knowledge of musical timing as detailed as that of experts. A crucial question, however, is whether this exposure-based knowledge can be used for production purposes or if its utility is limited to recognition and discrimination purposes. With regard to film production, viewers may have gained exposure-based knowledge of typical film features for specific genres and emotions, but might feel hindered in applying that knowledge in production because of the complexity of the task of making a film. On this assumption we expect that when provided with a production task and production toolkit specially designed for laypeople, they are able to produce a film scene that exhibits genre-typical features indistinguishable from scenes produced by production experts. In order to test the ability of laypeople to apply exposure-based genre knowledge, we gave participants the task of creating several video animations—each representing a specific film genre—by adjusting four movement parameters affecting the actions of two characters (two blocks chasing each other). The choice of movement parameters in this study is deliberate and builds on previous research by the authors. Visch and Tan (2007) showed that a film feature figure movement can provide a strong genre cue. For instance we showed that acceleration of film fragments cues the viewer to recognize these as comedy, while deceleration cues recognizing drama (Visch & Tan, 2007). In Visch and Tan (2009) we showed that not only movement velocity but three other parameters of figure movement in feature films have specific genre-cuing effects as well. Differing object velocities made viewers consistently recognize specific genres, and movement parameters fluency, efficiency, and proportion contributed to this effect as well. In this study, participants (N = 52) were asked to judge the fittingness of the produced animations to four genres, comedy, drama, action, and non-fiction. Analyses of fittingness scores revealed that low figure velocity was prototypical for drama, consistent with the Delsarte’s dance theory (Shawn, 1974) to communicate profound and serious emotion by using slow movements. High object velocity was judged by our participants as prototypical for action, in line with the action genre’s aim to impress (Neale, 2000). Comedy attribution was typically evoked by 1) high movement efficiency, bordering on the unrealistic; 2) low fluency, manifesting as staggering movement, as in the stop-and-go chases of Laurel and Hardy; and 3) low body deformation. The latter refers to the degree to which figures tend to alter shape when taking bends, a feature exploited in a well-known comic animation technique of ‘squash and stretch’ (Thomas & Johnston, 1981). The present study used these four most effective movement parameters for genre recognition as a starting point for a genre production task. A device featuring interactive sliders was built by the authors. Sliders affected a running animation of two chasing blocks in real-time, the same as used in the earlier studies. The task for participants was to produce four animations by setting the four sliders, such that the resulting animation would be typical for each of four basic genres: comedy, drama, action, and non-fiction. These four genres are renown for manifesting themselves as a stable set of archetypical genres (Frye, 1957; Neale, 2000) throughout history (c.f. Baxter & Aristotle, 1997) and across different artistic forms and media including plays, paintings, literature, and film. Moreover, these genres represent the stable core of film genres that other fiction genres like romantic comedy and horror (Carroll, 2003), or non-fiction (Plantinga, 1997) can be regarded to branch out from (Visch, 2007). In order to test whether laypeople can apply their exposure-based knowledge to production tasks in ways comparable to knowledge gained through production experience, the present experiment asked two groups of participants, professional animators and production-untrained film viewers, to produce four genre-typical animations by setting the four movement sliders. If untrained viewers can apply exposure-based knowledge in production, it should be expected that they 1) are able to produce video animations using knowledge that is normally used in recognition tasks, 2) their productions are similar to those created by professional producers given the same requirements. The experimental task involves the production of four genre-typical animations using a digital toolkit designed by the authors with Maya 3D. 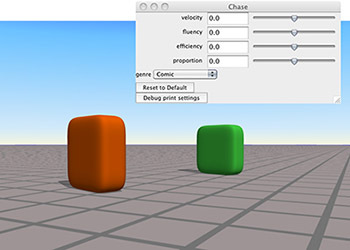 A 3D animation was created featuring two blocks chasing each other (see Figure 1). In this elementary narrative, the red block chases the green block (see Figure 2 for animated paths) and finally catches the green block. The chase lasts ten seconds and was played as a continuous loop. While it was running, participants could adjust the movements of the blocks in real-time by setting four sliders. This task addresses participants’ knowledge in that they had to create four animations that each represented a specific genre: comedy, drama, action, and non-fiction. Figure 1. Screenshot of the experimental setup for genre-specific animation production. Figure 2. The efficiency slider influences the efficiency of the path of the chaser (orange-coloured object). The four sliders were programmed to directly affect the following parameters of the blocks’ movements: Velocity, efficiency, fluency and deformation. Sliders could be moved upward to +1, or downward to -1, in ten steps each. Participants were presented with the four sliders set at the middle (0) position associated with the block movements that were established in Visch and Tan (2009) study as indicative of the non-fiction genre. The ‘velocity’ parameter is fundamental to all object movements since it combines time and place. Therefore, velocity has clear psychological attribution effects: Fast body movements lead to attribution of anger, joy, surprise, and excitement, while slow movements lead to attributed emotions such as grief, sadness, weakness, and sympathy (Scherer & Ellgring, 2007). In the present setup, the velocity slider allowed for film speed ranging from 15% in the -1 position to 100% in the 0 position to 185% in the +1 position. The ‘efficiency’ slider affected the path of the figures. While bends in the chased block’s path were held constant, those of the chaser could be varied by adjusting the position of the efficiency slider. When the slider was set to neutral (0), the chaser’s path was equal to the path of the chased (see the green path in Figure 2, middle panel); when it was set to maximum (+1, bottom panel), the chaser followed a straight line to the destination of the chased; when the slider was set to minimum (-1, top panel) the chasing block’s path took wider bends than the chased. Other slider settings were linear interpolations of the aforementioned. 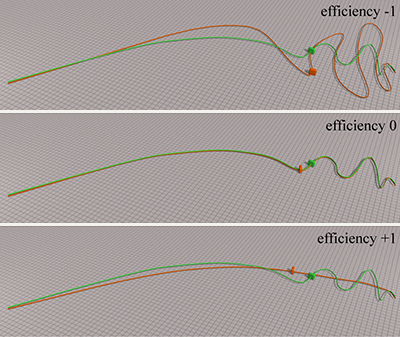 The ‘fluency’ slider controlled the smoothness of velocity transitions in bends. Setting the fluency slider to neutral (or 0, see Figure 3, middle panel) makes the orange chasing block move with constant speed, slowing down slightly when making a bend. Setting it to its maximum (+1, right panel) decreased the speed of the chaser when taking a bend. Fluency set to its minimum (-1, left panel) froze the chaser for a few frames in the middle of the bends. Other slider settings were linear interpolations of the aforementioned. Figure 3. The fluency slider influences the smoothness of the velocity transitions in bends. The ‘deformation’ slider controlled the dynamic shape alterations of a non-rigid object when it takes bends in its course. When a non-rigid object goes through a bend, the object will deform. Deformation is larger in horizontally-shaped objects than in vertically-shaped ones. In film genres, this effect can be seen when highly-elastic comic actors spread their arms and legs horizontally when moving. Action actors, on the other hand, typically remain rigid and straight when running a bend, minimizing body deformation as much as possible. The deformation slider was programmed by varying the width to height ratio of the figure, while keeping its volume constant (see Figure 4). When the slider is set to -1, the shape of the chaser is wider and shorter, resulting in a large deformation when taking a bend (see wedge-like shape in Figure 3). Set to +1, the chaser is slimmer and taller showing less deformation when taking a bend. Figure 4. The deformation slider influences the deformation of the chaser. Individually-tested participants were seated before a computer screen and instructed to set the four interactive sliders (velocity, efficiency, fluency, and deformation) so as to directly affect the four parameters of the blocks’ movements. The operation of the sliders was briefly explained and participants were invited to explore and play with them for a few minutes before the experiment started. During the experiment, participants had to compose according to their own view an optimal configuration of the sliders for each of the four genres, comedy, drama, action, and non-fiction. All participants created scenes for all four genres in the same order using all four sliders. The professional participant group was comprised of fifteen professional animators—five females, ten males—recruited from a master class at a post-graduate animation institute (i.e., NIAf, Tilburg, an animation academy for professional animators already in possession of professional experience with animation techniques and production). The lay participant group was comprised of eighteen students of social sciences from the University of Amsterdam—nine females and nine males—who had no experience in film production. A 2 × 4 × 4 ANOVA (2 expertise × 4 genres × 4 movement parameters) showed no significant effect of age or gender on the dependent slider settings and yielded a significant interaction effect of genre and movement parameters on slider setting [F (9, 524) = 9.49, p < .001, η2 = .33]. This indicates that the 16 conditions [genre (4) x parameter (4)] affected the dependent variable slider setting. As expected, neither a significant main effect of expertise [F (1, 524) = .18, p = .68, η2 = .001], nor an interaction effect [expertise x genre: F (3, 524) = .79, p = .50, η2 = .01] was found. Figure 5 shows that the 95% confidence intervals for all genre-movement parameter combinations of professionals and laypeople overlapped, indicating no significant group differences. Correlation analyses showed a significant relationship between the average settings of the professional and non-professional group: rs(one-tailed) = .79, p < .001. Figure 5. Plot depicting means and error bars of slider settings by experts and lay participants for each of the 16 slider settings. 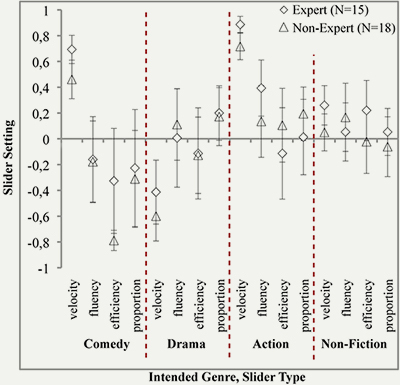 It can be seen in Figure 5 that non-fiction production yielded more neutral settings than other genres. Comedy was characterized by high velocity and low fluency, low efficiency and low deformation slider settings. Drama was characterized by low velocity, and action by high velocity- and high fluency settings. In our previous experiment on genre recognition (Visch & Tan, 2009), we used the same animations but movement parameters had been pre-set by the experimenters; the participants’ task was to categorize the animations as to genre. The results of the recognition experiment and the present production experiment show some similarities in parameter patterns for genre expression. In both experiments, comedy is characterized by a high velocity and low fluency, low efficiency and low deformation. Drama is characterized by a low velocity and action by a high velocity and high fluency. The results of this study reveal a similarity between lay participants and expert animation producers in creating genre-specific animation content using a four-slider animation toolkit. This finding confirms our predictions that 1) untrained users are able to apply implicit genre knowledge acquired from exposure not only for recognition tasks but also for production tasks; and 2) their productions are similar to those created by professional producers given the same requirements. The consistency between experts and laypeople in applying genre-typical movement knowledge for production elaborates on our previous study (Visch & Tan, 2009) that showed a high consistency within laypeople in applying genre-typical movement knowledge for recognition tasks. Taken together, the results indicate that knowledge of genre-typical movements, such as a high velocity for comedy and action genre, can be gained by regular exposure, i.e., everyday watching of genre movies, and can be applied for recognition tasks as well as for production tasks. A cognitive account of the layperson’s genre knowledge can be found in the embodied cognition model stating that the representation of concepts used in categorization, such as genres, contains sensorimotor elements (Barsalou, 2009). Relevant sensorimotor elements include movement perception and emotion acquired in perceptual learning as an implicit consequence of exposure. A complementary account is offered by a general cognitive-cultural capacity to recognize communicative intentions underlying visual representations (Tomasello, 1999): Regular film viewers identify emotional and genre effects intended by filmmakers plus related patterns of surface features, such as specific actor movements. It is in line with both accounts that all participants were informally observed applying a trial-and-error strategy to arrive at their genre productions. Allowing users to apply trial and error strategies is one of the essential toolkit elements according to von Hippel and Katz (2002). The generalizability of the animation toolkit designed for this experiment is obviously not without limitations, but these have to be considered in the right perspective. On the one hand, it is likely that other animation toolkits would yield other results. It can be assumed in particular that differences in slider settings between expert producers and laypeople would increase with increasing amounts of possible settings or design freedom. Our toolkit was balanced to be handled by lay participants as well as by experts. It is therefore quite risky to assume that laypeople can handle any animation toolkit as well as experts. On the other hand, our toolkit offered a considerable degree of design freedom that could have allowed for much larger variation between the two groups than the, non-significant, variation found. Each participant had to configure four sliders in each of the four tasks (i.e., make a comedy, drama, action, and non-fiction). Each of the four sliders had 21 positions resulting in (21 × 21 × 21 × 21 =) 194,481 possible configurations for each of the four tasks. The difference between each of the settings in Figure 5 showed that almost the whole range of possible slider settings (from -.90 to .95) was covered by all participants. Nonetheless, differences between professionals and laypeople did not obtain. Hence it would be rather far-fetched to attribute the found similarity of slider settings to the design of our toolkit. This leads us to maintain our conclusion that laypeople can apply their exposure-based knowledge for production tasks in ways similar to production experts. It should be noted that our production tasks did not involve user content generation from scratch but involved applying production skills by adjustment of a given product. Another limitation of the animation toolkit used in the study may be that it is specifically aligned to the knowledge of the user and, moreover, allows for a trial-and-error strategy. This limits the generalizability of our findings with respect to a successful use of exposure-based knowledge, in that this knowledge may only suffice for production when using this tailored toolkit. There may be truth in this, but the design of the presently used toolkit revealed another insight: The interactive slider device was demonstrated to involve users in content generation at a much deeper level than standard toolkits do. At present, toolkits are developed by companies as service systems to empower users to have products meet their personal demands (von Hippel & Katz, 2002). Companies typically translate individual user needs into production specifications answering those. As demonstrated by Franke, Schreier, and Kaiser (2010), users are strongly motivated to invest considerable effort in content generation. Investing their effort makes them aware of being the creator of a product, eliciting an “I designed it myself” effect, which in turn increases the user’s preference for the end-product in terms of both affective and economic value. It has been recommended that toolkits be designed for a good fit of the product to the user’s needs, with comfort in the design process, and with speed in the design process (Randall, Terwiesch, & Ulrich, 2007). However, too-comfortable toolkits may not utilize the user’s motivational potential for content generation to the fullest. It can be argued that toolkits that are more demanding, for instance in challenging the user to apply implicit knowledge, will result in larger user preference for the end product. Future experiment manipulating a variety of simple to complex toolkits and measuring user product preference should be conducted to validate such a prediction. How can our findings be applied to existing animation toolkits? Existing video and animation toolkits show a wide variation in their dependence on user’s knowledge. Animation toolkits targeting laypeople typically reduce their creative freedom. They just allow users to input dialog to pre-animated characters (e.g., www.voki.com) or to select a configuration of predefined plots, characters and backgrounds (e.g., www.dvolver.com). By contrast, animation toolkits catering to professional users (e.g., ToonBoomAnimatePro or Autodesk Maya) are designed to provide users with as much design freedom as possible (c.f., Maya even provides its users a program language to alter the standard Maya animation toolkit). We argue that layperson knowledge of animation would be sufficient to enable generation of tagline and storyboard. Our study suggests that a next step, such as creating motion illusions between animation frames by ‘in-betweening’, might be left to production-untrained persons as well, because their knowledge of movement parameters relevant for realizing specific genres allows them to do so. Obviously it cannot be expected that the artistic quality of untrained user-generated products (from tagline to in-betweening) would match that achieved by professionally-trained animators. Nor can it be expected that laypeople can handle as large a creative freedom as professional animators. Given the four levels of creativity of doing, adapting, making, creating (Sanders & Stappers, 2012), it might be supposed that experts are trained to create animations from scratch and thus can handle toolboxes fitting these capabilities, whereas laypeople might be more inclined to adapt existing animations to their needs. Our research could be applied as well to enrich communication in content sharing and generation platforms, such as Facebook, YouTube or WhatsApp. These platforms allow users to upload and share dynamic content such as video and animation, but generation is mainly limited to static content, such as texts or emoticons, or to adjusting static content, such as changing picture appearance using Instagram. The detailed knowledge of users on genre-specific movements could be applied within a toolbox to enrich content generation in these platforms. For instance, the velocity of videos might be adjusted using sliders to express dramatic or comical intentions. Another application might be the generation of emoticons. Often emoticons libraries are huge, and it takes time to find an emoticon that best fits a message. When users are provided with some basic movement sliders to adjust the velocity, fluency and deformation (squash and stretch) of emoticons, they could apply their refined movement knowledge to personalize their communication and make it better fit their emotional intentions. We conclude for now that, based on the present findings, it seems possible to offer users more design freedom by involving them into the product design on a deeper level of production. Choosing movements as in our study is but one example; selecting and shaping materials or shapes would be others. We believe that when toolkit design aligns to users’ implicit knowledge of products, such as animation, it will result in greater user enjoyment of both the task and the product, due to satisfaction of basic motivational needs, such as those for competence and autonomy (Deci & Ryan, 2000). Future research should investigate the motivational factors of toolkit use, as well as the optimal design freedom that can be offered by toolkits for each specific user and end product domain. Our research elucidated the potential of toolkits to involve users at a much deeper level of content generation than standard toolkits do. Baxter, J., & Aristotle, P. (1997). Aristotle’s poetics (G. Whalley, Trans.). Montreal, Canada: McGill-Queen’s University Press. Barsalou, L. W. (1999). Perceptual symbol systems. Behavioral and Brain Sciences, 22(4), 577-660. Barsalou, L. W. (2009). Simulation, situated conceptualization, and prediction. Philosophical Transactions of the Royal Society Biological Sciences, 364, 1281-1289. Carroll, N. (2003). Engaging the moving image. New Haven, CT: Yale University Press. d’Ydewalle, G., & Gielen, I. (1992). Attention allocation with overlapping sound, image, and text. In K. Rayner (Ed. ), Eye movements and visual cognition (pp. 415-427). New York, NY: Springer. Dalla Bella, S., & Peretz, I. (2005). Differentiation of classical music requires little learning but rhythm. Cognition, 96(2), 65-78. Deci, E., & Ryan, R. (2000). The ‘what’ and ‘why’ of goal pursuits: Human needs and the self-determination of behavior. Psychological Inquiry, 11(4), 227-268. Dienes, Z., & Perner, J (1999). A theory of implicit and explicit knowledge. Behavioral and Brain Sciences, 22(05), 735-808. Franke, N., Schreier, M., & Kaiser, U. (2010). The “I designed it myself” effect in mass customization. Management Science, 56(1), 125-140. Hayward, M. (1994). Genre recognition of history and fiction. Poetics, 22(5), 409-421. Honing, H., & Ladinig, O. (2009). Exposure influences expressive timing judgments in music. Journal of Experimental Psychology: Human Perception and Performance, 35(1), 281-288. Neale, S. (2000). Genre and Hollywood. London, UK: Routledge. Plantinga, C. (2007). Rhetoric and representation in non-fiction film. Cambridge, UK: Cambridge University Press. Randall, T., Terwiesch, C., & Ulrich, K. (2007). User design of customized products. Marketing Science, 26(2), 268-280. Sanders, E., & Stappers, P. (2012). Convivial toolbox: Generative research for the front end of design. Amsterdam, the Netherlands: BIS Publishers. Scherer, K., & Ellgring, H. (2007). Multimodal expression of emotion: Affect programs or componential appraisal patters? Emotion, 7(1), 158-171. Shawn, T. (1974). Every little movement: A book about Delsarte (2nd ed.). New York, NY: Dance Horizons. Thomas, F., & Johnston, O. (1981). The illusion of live: Disney animation. New York, NY: Disney Editions. Van Lommel, S., Laenen, A., & d’Ydewalle, G (2006). Foreign-grammar acquisition while watching subtitled television programmes. British Journal of Educational Psychology, 76(2), 243-258. Visch, V. T. (2007). Looking for genres: The effect of film figure movement on genre recognition. (Doctoral dissertation). Vrije Universiteit Amsterdam, Amsterdam, the Netherlands. Visch, V. T., & Tan, E. S. (2007). Effect of film velocity on genre recognition. Media Psychology, 9(1), 59-75. Visch, V. T., & Tan, E. S. (2008). Narrative versus style: Effect of genre-typical events versus genre-typical filmic realizations on film viewers genre recognition. Poetics, 36(4), 301-315. Visch, V. T., & Tan, E. S. (2009). Categorizing moving objects into film genres: The effect of animacy attribution, emotional response, and the deviation from non-fiction. Cognition, 110(2), 265-272. Yang, M., & Roskos-Ewoldsen, D. (2007). The effectiveness of brand placements in the movies: Levels of placements, explicit and implicit memory, and brand-choice behavior. Journal of Communication, 57(3), 469-489.